Fibreglassed foam blank, 1/4" redwood stringer, spray, resin pinlines. Deck: LOPEZ - pencil on stringer, rear sweet .spot. Image right is not from this board, but #181 does have the same markings. I neglected to take a suitable photograph. Sprayed orange deck panel , yellow rails and thin black resin pinlines. Shaped by Gerry Lopez circa 1972, apparrently for his own use. See below. Subsequently purchased by Terry Richardson and surfed in Hawaii, circa 1977. See below. Board sold to Wollongong surfer, circa 1980. Special Note : The off-set lighting bolt graphic is not a decal. 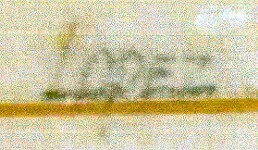 It has been applied in paint by hand (brush or sprayed?) and the board possibly dates from (and could even pre-date) the the earlier days of Lightning Bolt Surfboards. A classic example of the Hawaiian Gun, that traces it's origin back to Fran Heath and John Kelly's Hot Curl design of the mid - 1930's. Pocket Rocket, for Plastic Fantastic Surfboards and Inter-Island Surfboards (image below),1968. Brewer's designs were a major shaping influence on his understudies - Jock Sutherland, Jeff Hakman, Reno Abelliro and Gerry Lopez. He started his own company, Lightning Bolt Surfboards, circa 1972. Although an talented surfer in all conditions, no surfer has been so strongly identified at one break like Gerry Lopez is with the Pipeline, Oahu. The longest reigning "Mr. 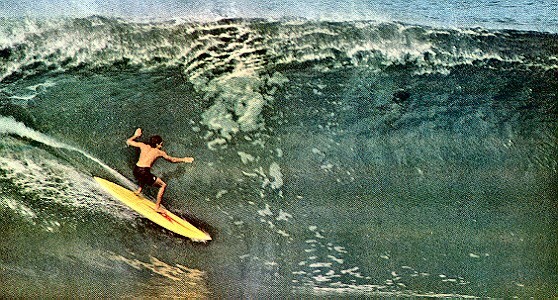 Pipeline", he set the standard for deep tube riding 1971 to 1977. His major contributions were the application of a fluid and relaxed style in extreme condition (see image below) and the principle that the safest place to ride large waves is inside the tube. These are reflected in the fine lines and subtle curves of the boards. The identification between Gerry Lopez and the Lightning Bolt logo is nearly as strong as that with Pipeline, although he left the company circa 1995. 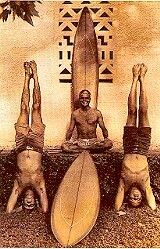 He was at the forefront in the extension of surfing in Indonesia, circa 1975. Gerry Lopez made further contributions in the development of Windsurfing, circa 1985, and Tow-in surfing, circa 1995. Terry Richardson from Wollongong, NSW, is a goofy-foot noted for h is performances on the South coast's many quality left-handers, in particular Wreck Bay. An Australian rider of the Bonzer design circa 1974, he competed with distinction in the initial professional surfing circuit, circa 1974 - 1978. Early shaping for Skipp Surfboards, Wollongong, NSW. He started his own company, Terry Richardson Surfboards at Wollongong, circa 1980. 1. Drew Kampion :The Life and Work of Richard Brewer. The Australian Surfer's Jourrnal Volume 2 Number 3, Winter 1999, pages 72 - 95. Deep Number 18, Spring 2000, pages 22 to 33. The cinematic performances of Gerry Lopez (surfing - not acting) are numerous and he regularly featured in surfing films throughout the 1970's. The Morning of the Earth sequences are the earliest that I am aware of. Terry Richardson and #181, Pipeline, Hawaii , winter 1976 - 1977. Surfer Volume 17 Number 6, March 1977, page 46.
the Gerry Lopez Lightning Bolt (#181) that you have listed on your site looks exactly like the one in the attached 1975 photos of Gerry's board quiver by Steve Wilkings. The photographs show Rory Russell, Jack Shipley, Gerry Lopez with a quiver of Lightning Bolts, circa 1975. In October 2005, Ben Hams commented on the very well known, and very highly respected Jack Shipley. Jack was the co-founder of Lighting Bolt surfboards along with Gerry in 1971, was head Hawaiian ASP judge, and is now head judge of the HASA (Hawaiian Amateur Surfing Association). Unfortunately the site appears to be unavailable as at June 2014. Gerry Lopez : a fluid and relaxed style in extreme conditions, Pipeline circa 1973. Surfer Volume 14 Number 3, September 1973, page 48.
and Pocket Rockets , Maui circa 1972. Volume 2 Number 3 Winter 1999, page 76. Geoff Cater (2003 - 2014) : #181 Lopez Lightning Bolt Pintail, 8ft 11in, 1972.